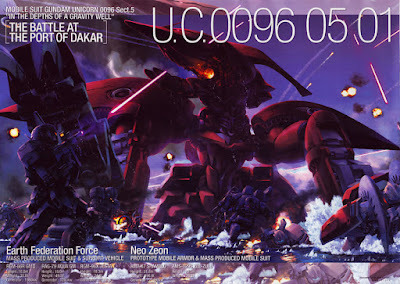 In 2006, Haratoshi Fuuki wrote the Mobile Suit Gundam Unicorn series of light novels (Japanese YA pulps). The story "In the Depths of a Gravity Well" featured a monstrous red mecha called the Shamblo, piloted by a female pilot and equipped with psychic projectors. The Shamblo's fate is the same as Shambleau's: incineration. An anime adaptation was televised in 2010. The Jirellians are an exceptionally talented race who can read people’s minds, but are now on the verge of extinction. When the two Jirellian girls Miezela Celestella and Mirenel Link were rescued by Garmillas President Dessler, it was thought that they were the only two left. However, when their mother planet was destroyed, Lerelai led a handful of survivors on a pilgrimage to Shambleau, which allowed them to avoid extinction. The Jirellians of Yamato 2199 bear little resemblance to Jirel of Joiry, but the homage paid to C. L. Moore is evident. Gender Bending with the Black Gods.